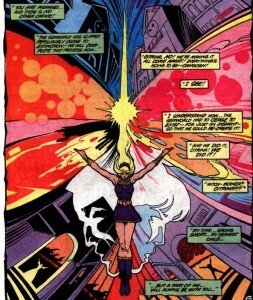 This issue is the halfway point of the second mini-series. It features the final confrontation between Amethyst and Fire Jade aka the late Lady Emerald. Also, Citrina wakes up for some cosmic magical shenanigans. 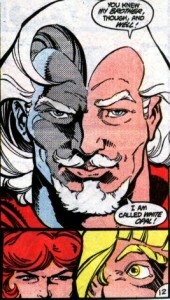 The Gemworld has a unique approach to video conference calling. Amethyst, Prince Garnet, and Princess Emerald are talking to the other nobles through some purple bubbles that show their disembodied heads. Lord Ruby thinks that Prince Garnet is mistaken, but Amethyst believes him. She’s called everyone together to tell them that Fire Jade is really the Lady Emerald. For some reason Lord Garnet isn’t there, maybe they are saving the big reunion scene with his son for later? Lady Topaz, charming as ever, suggests that Amethyst has gone mad because Lady Emerald is dead. 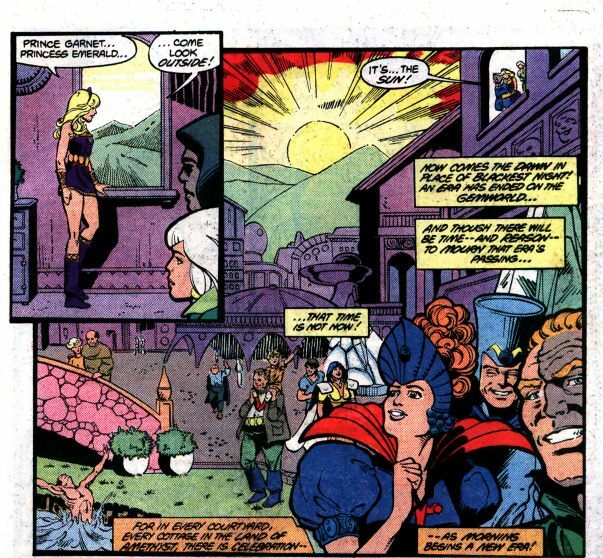 There’s a bunch of exposition from Prince Garnet outlining why Lady Emerald has returned from the dead as Fire Jade. Then he drops a tidbit of information that explains why the storms and Citrina’s illness are linked. Citrina didn’t discover the Gemworld, she actually created it out of bits of magic from different worlds. She was the most powerful sorcerer of Earth when she was young. Fire Jade’s plan of creating storms to weaken the Gemworld’s magic and sending Sardonyx to kill Citrina had one goal – the total annihilation of the Gemworld. If Citrina dies the Gemworld will cease to exist. Prince Garnet warns that he expects Fire Jade to attack the Emerald Domain first, because she’ll be strongest there. If they fail to fight her off the other nobles must prepare their own defenses. Fire Jade uses her magic to rip emeralds out of the ground and summon spirits from the dead. The wraiths attach themselves to the gems and surround Amethyst and her allies. On Earth the Winstons and Emmy are showing Tom and Rita Amy’s glowing coma body. I think it is slightly creepy to bring other people in to watch someone while they are mystically slumbering, but maybe if Amethyst stays on the Gemworld they could rent Amy out as an energy efficient source of light. 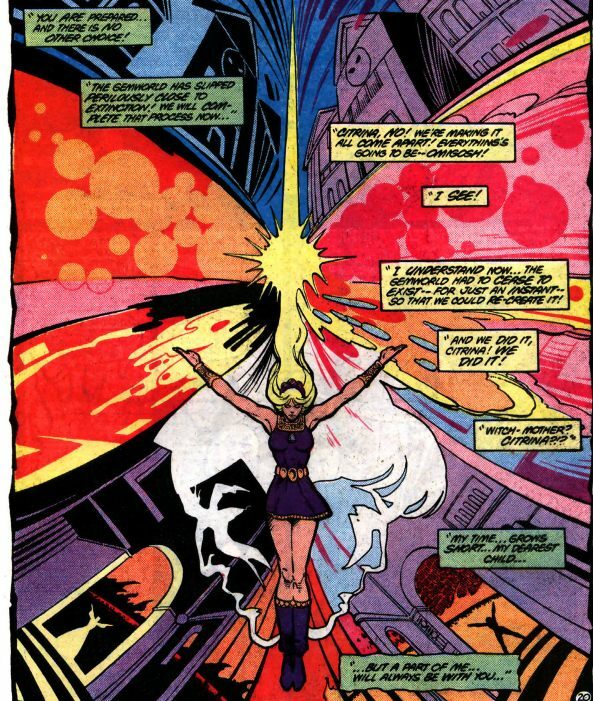 Rita explains to Tom that Amy has an otherworldly magical self called Amethyst. Emmy introduces herself as Princess Emerald and explains that she’s not actually Amy’s cousin. 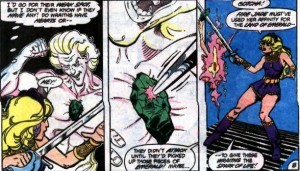 Amethyst continues to fight the wraiths and she figures out their weakness. Prince Garnet is so supportive, as he immediately notices how Amethyst defeated the wraith and orders the Emerald soldiers to aim their blows at the gems inside the wraiths. Then he reaches in with his bare hand and yanks an emerald out of a wraith’s torso. I’d like to see Prince Topaz do something as gutsy as that. Really, it is a shame that Prince Garnet is so much older than Amethyst and hopelessly in love with a dead woman who has turned evil. I always thought that Prince Garnet and Amethyst would make a nice couple. Princess Emerald tries to use her magic to grab the emeralds away from the wraiths, but Fire Jade summons up a gust of wind to send her away. Prince Garnet flies up and rescues her. He comments “Though she who calls herself Fire Jade was in those bygone days my greatest friend, I’ll see her new and most unholy life put to a close.” Amethyst hands off her sword to a soldier and Garnet and Fire Jade blast magic at each other. In the meantime Princess Emerald is suddenly inexplicably struggling with the creature from the nameless realm. It is grabbing the back of her neck. Prince Garnet tells her to give up the creature. He says that until the Gemwold is recreated in its image, it has to depend on pawns like Fire Jade. Fire Jade isn’t happy about being referred to as a pawn and she causes some nearby masonry to turn into yucky green tentacles that ensnare Prince Garnet. Princess Emerald throws off the creature and tries to fight Fire Jade with her elemental powers. Fire Jade is easily able to fend off her attacks. Amethyst prepares to blast Fire Jade when the princess calls out “Mother! Behind You!” Amethyst asks why she warned Fire Jade, and Princess Emerald says “I couldn’t let you kill her, Amethyst! She is still my mother!” Amethyst says that even if her blast had done more than knock out Fire Jade she isn’t sure if you can kill someone who is already dead. Back in the kingdom in the clouds Prince Topaz and Lady Turquoise make a new acquaintance who looks surprisingly similar to someone they already know. Prince Garnet is concerned for Lady Emerald’s soul. He says that if Amethyst destroys her in her present form, she’ll be “forever barred from entering the realm of gathered souls.” Amethyst is sympathetic to his concerns but doesn’t know what to do when Fire Jade wakes up. The creepy creature yells that they’re “paralyzed by good intentions just as the Lady Emerald was trapped by fear. The Gemworld will be mine!” Prince Garnet flicks the creature aside and Princess Emerald tries to talk to her mother. Fire Jade wakes up and decides to turn herself into the Human Torch. She bursts into flames and grabs her daughter’s face, yelling that she gave her breath so she can take it away. Prince Garnet sees that Fire Jade is stealing the princess’ life force. Fire Jade blasts everyone off the roof where they were resting, but Amethyst conjures up a giant purple fluffy pillow to break their fall. 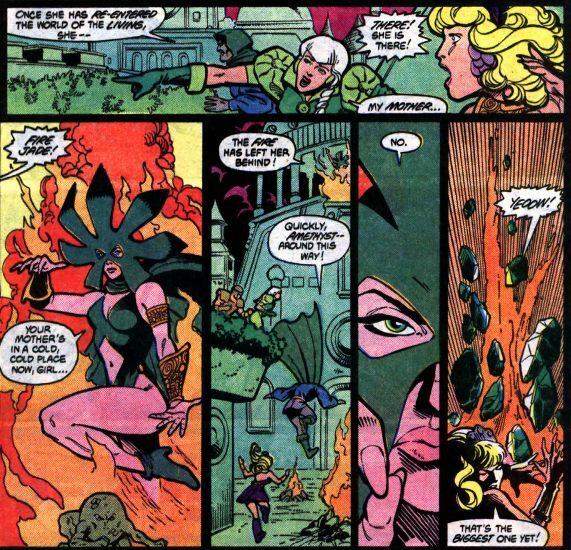 Fire Jade starts to hesitate as she prepares to attack again, and the spirit form of Lady Emerald separates from Fire Jade’s body with the help of a flying tackle from Amethyst. The creature can’t exist on the Gemworld anymore and it poofs out back to its own dimension. Princess Emerald runs to embrace her mother saying “Mother you are saved! And you’re alive!” but Lady Emerald throws up a barrier between them, saying if any living thing touches her they will join her in death. Prince Garnet asks why she is able to remain on the Gemworld, referring to a teaching of the ancient ones. Lady Emerald warns “Do no place all trust with the ancient ones, old friend…for they were the masters of the one who did master me!” Prince Garnet is shocked that his masters were in league with the creature. 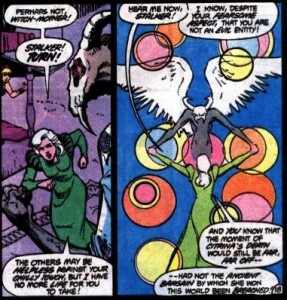 Lady Emerald doesn’t have time to explain, and before she leaves the Gemworld forever she has to rescue Citrina from the Stalker of Souls aka the Angel of Death. Amethyst creates a portal to transport everyone to Castle Amethyst, even though it will drain most of her energy. They arrive at Citrina’s bedside. Amethyst thinks that everything is ok, but Citrina wakes up and says “No child, it is you who are mistaken.” The stalker of souls appears. Citrina says that even though the magic stolen from the Gemworld is returning due to the defeat of Fire Jade, it is too little and too late to help her. Lady Emerald springs into action and starts to wrestle with death. Lady Emerald says that the Ancient Ones breached their bargain with Citrina and hastened her death. Amethyst asks Citrina to explain why she wasn’t trying to prevent her own death if she knew the Gemworld would die with her. Citrina says that she had planned to move the Gemworld to a safer place before her death, but now her time has run out. 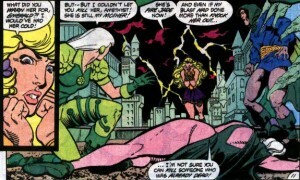 Lady Emerald continues to struggle with the stalker. Citrina decides that there might be time for one last spell. She tells Prince Garnet to use some of the knowledge from his studies with the Ancient Ones and unite her mind with Amethyst’s. Citrina says that she can create the Gemworld again “but this time through the magic of a young and strong and noble child!” Amethyst isn’t ready, but there isn’t time to wait. The Gemworld is recreated and Amethyst takes Citrina’s place. The ancient ones, who look vaguely like slightly humanoid gray dinosaurs sense the change and they are more than a little annoyed. Amethyst cries over Citrina’s dead body. Princess Emerald tries to run to her mother again, but Prince Garnet holds her back. The Stalker of Souls leaves the Gemworld with the spirits of Citrina and Lady Emerald. The sun comes out and everyone in the Gemworld is celebrating the dawn of a new era. Amethyst is sad, thinking of all the things that she meant to say to Citrina. She hears Citrina’s voice saying “a part of me will always be with you, Amethyst.” Amethyst heads out with Prince Garnet and Princess Emerald to join the party when she thinks about how she was only called to the Gemworld to help Citrina. She then promptly pops out of existence. The next issue features some trippy dreams and Ernie Colon comes back to do the art! 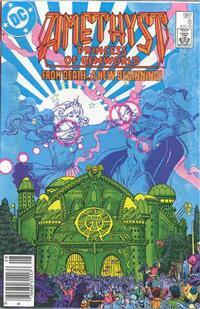 This entry was posted in comics and tagged Amethyst Princess of Gemworld on 11/17/2008 by Anna.